5.0 out of 5 starsWhat smell? I buy everything on Amazon and never take the time to write reviews. I am writing one for this product because nearly every review comments on the smell. I am six months pregnant and this is going in the nursery. As soon as I got it I opened the box to air it out because some reviewers claim the pouf takes months to stop smelling. There is literally no smell whatsoever. I don't know if the color or the material dictates whether or not your product will smell but I just came here to write that mine doesn't smell like anything at all. It's so tough to decide how many stars to give this. It's really beautiful and seems to be extremely well made. It's also a great price - I haven't been able to find anything similar that is even close to as affordable. However, it STINKS. Some recent reviewers have said it does not stink, and from what I can tell from their comments, the white pouf seems to be free from the smell. I ordered the dark brown and it has such a strong scent. Based on a few comments and a recent trip to a petting zoo, I believe the scent is goat urine which must be used in the dying proces. I left it outside for a week, tried a vinegar solution and a different baking soda solution with no luck. The smell has faded some (had it it about a month) but it is still there. So, be warned. 1.0 out of 5 starsSmells horrible 7 months later. For all of those wondering if the smell will leave--it won't. I have had this for 7 months, and it still smells horrible. I wish I had returned it--I kept hoping it would get better and now I see it is too late to return. I think I may have to throw it out. I have spent hours trying every home remedy I can find online to get the smell out and also left it out in the sun for days. When it is in my home, everyone who comes in comments on the "weird smell"--which is for sure formaldehyde. I have the pink one too and it only smelled for a few days and has no smell now. This dark tan one is the one that smells awful. Ugh. I received my pouf yesterday. Despite everything I read about the smell, I ordered it anyway. Much to my delight, there is no smell at all! However, I'm not crazy about the color. I ordered dark tan and its more of a peach color. It's much lighten than what is pictured. Overall, the product is well made, sturdy and very prettty. Have since returned this for a different color. It's been almost 2 months and I still don't have the replacement. Have emailed seller 3 times and no response. Awful! Updated Review (dark tan pouf) so we returned the brown one and ordered the dark tan. It is very close to what is shown in the website. No smell at all. Sturdy and well made like the first one we ordered. I have uploaded pictures of the brown (the one we received first and end up returning) and the dark tan (the second one we ordered and the one we kept). Easy return. Review of the brown pouf: First of all the pouf did not have any smell. 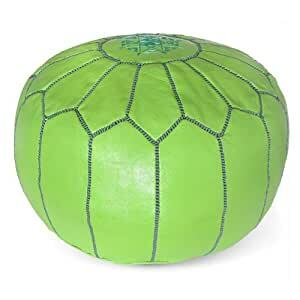 The pouf is well made, sturdy and comfortable. However the color is not like the one depicted in the picture. I bought the brown and it looks more like a faded brown very pale. We might return it, since we were expecting a vibrant brown, like the one in the advertised picture for the brown color. Quite disappointed that the color is not even close.